Are Any of These 29 Decoy Yahoo! Logos Better Than the Original? Tonight, at midnight Eastern Standard Time, Yahoo! will unveil its new logo. If you're confused—yes, Yahoo! 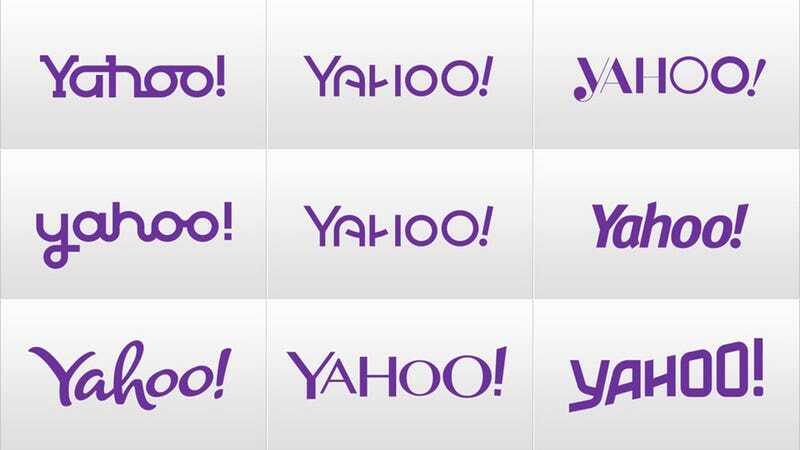 has been "unveiling a new logo" (read: comic sans rendering of Yahoo!) at midnight for the past 29 days. It's all part of an unusual plan to evade the virulent public backlash that has haunted many recent corporate rebrands. But will it work? Yahoo! joins a long list of companies which have tried unusual strategies to avoid the inevitable internet commenter pile-on—the likes of which caused Tropicana, Gap, and a handful of other companies to backtrack on new logos in the past. Chiquita Banana, for example, asked designers to submit their ideas and then invited the public to vote. Yahoo!, meanwhile, decided to flood the hate market with 29 bad logos, which will—in theory!—amplify the awesomeness of whatever it unveils tonight. So why do companies continue to attempt new logos, anyways? For one thing, a new logo is a way to signal a new guard—which wouldn't hurt, in the case of Yahoo! 's new CEO, Marissa Mayer. Meanwhile, Fast Company claims it has to do with Mayer's love of testing (she famously oversaw the infamous 41-shades-of-blue test at Google), but that doesn't really make sense either; Though Yahoo! has tested a few different logos over the past few years, a post about the 30 Days of Change project describes it as a celebration, with no bearing on the penultimate rebrand. More likely, it has to do with avoiding the inevitable backlash against any new logo, no matter how well-made. After so many high-profile logo debacles (people hate change! who knew? ), Yahoo! may be trying to sidestep the controversy by both dulling the shock of the new—and, more cynically, by lowering expectations. According to Polar, the internet polling website, the only challenger from the past month to have beaten out the original logo is Day Ten—a blockier, san-serif version of the current Yahoo! logo—by almost double the closest competitor. So, what do you think? Has Yahoo! struck gold with any of these "decoy" logos?